Collective wisdom is a perennial topic in the social sciences. How and when can groups make decisions that are better, in some sense, than the decisions of individuals? One broad tradition emphasizes the folly of crowds, another their wisdom. On the one hand there is Madison’s dictum in Federalist No. 55 that “had every Athenian citizen been a Socrates, every Athenian assembly would still have been a mob.” On the other hand, a rough contemporary of Madison, the Marquis de Condorcet, proved a “Jury Theorem” which shows (in the simplest version) that under certain conditions the majority vote of a group will be more likely to be correct than the vote of the individuals in the group, and will converge on perfect accuracy as the size of the group increases. In recent decades, social scientists working in economics, law, politics, and psychology have obtained a measure of critical detachment from the extremes of both traditions, and have explored the conditions under which Madisonian skepticism or Condorcetian optimism is more likely to capture the truth about groups. Even more recently, however, it has become clear that this sprawling body of work suffers from a major limitation: it focuses solely upon decision-making by groups of human animals. It turns out that groups of non-human animals—not just higher primates such as chimpanzees, but social insects, herding mammals, and many others—make collective decisions, use observable “voting” rules or decision procedures to do so, and in many cases make group decisions that are quite accurate, in the sense that they promote the common interests of the group’s members in survival and reproduction. Biologists such as Larissa Conradt of the University of Sussex, theorists of group decision-making such as Christian List of the London School of Economics, and many others have begun to compare collective decision-making in human and nonhuman animals. In general, there is a kind of tradeoff inherent in this research program. Although comparisons between human and non-human animals are more far-fetched than comparisons between human groups in different times and places, groups of non-human animals can be controlled and manipulated through experimental procedures, producing information that can only be obtained for human groups through rare natural experiments or messy observational studies. A related benefit is that non-human animal groups offer pure cases. So-called “eusocial” (hypersocial) insects use modes of reproduction that make conflict of interests minimal within the group, implying that the only source of disagreement among individuals is differences of information or belief. Human groups, by contrast, are analytically messy because individuals often have differing beliefs and differing bedrock interests, preferences, aims, or values. This underscores that humans are unlike social insects, but the study of the hive neatly separates the problem of aggregating beliefs from the problem of aggregating conflicting preferences, and thus gives the analyst of group decisionmaking a new type of traction. Thomas Seeley, an entomologist at Cornell University who studies honeybees, has made important contributions to this growing body of work on group decisionmaking in nonhuman animals, often working in conjunction with Kirk Visscher of the University of California. Seeley has studied, among many other things, how honeybee colonies choose foraging sites, and how swarms that break away from the parent colony choose a new nest site. This book focuses on the latter choice, which is among the most consequential that a group of honeybees can make. The swarm faces both acute time pressure—having left the shelter of the colony, it has only days to find and settle in a suitable nest—and an open-ended menu of possible sites. Candidate sites must first be identified in the environment and then evaluated for quality on various dimensions, such as volume, spatial orientation, and security. Seeley shows through cunningly devised experiments that swarms quite often settle upon the best available nest site within a relatively brief period, where “best” is judged not by the arbitrary judgments of the biologist but according to criteria that the bees themselves can be observed to use in the wild. The swarm displays a kind of collective wisdom, despite the limited cognitive capacities of its members. How does the swarm decide so quickly and accurately? A mistaken view, going back at least as far as Aristotle, is that the swarm is a monarchy, whose queen (Aristotle thought king) decides for the group in hierarchical fashion. Seeley explains that the “queen” exercises little centralized control over either hive or swarm, beyond stamping out potential competition from other queens. Instead, the swarm reaches excellent collective decisions through decentralized search mechanisms. Members of a committee of “scout bees”—morphologically identical to the other bees, who unlike some other eusocial insects generally lack genetically specialized castes—explore the landscape and then report back, conveying information about candidate sites by means of “waggle dances.” Other bees investigate those sites, evaluate them, and report back in turn. 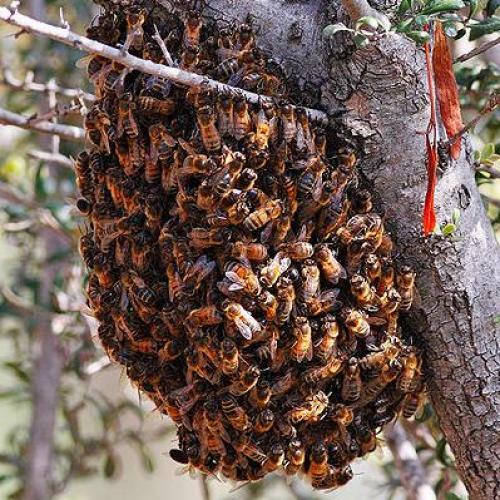 When a sufficient number of bees converge on support of a particular site, the swarm as a whole moves to its new home. Machiavelli famously pronounced that “a multitude without a head is useless,” yet the bee swarm achieves its collective aims without much hierarchical leadership. A precise account of the bees’ search mechanisms is offered in an earlier paper by Seeley, List, and Christian Elsholtz, the conclusions of which are incorporated into the book. Using computer simulations as well as direct observation, the authors find that the key to the bees’ success is a particular combination of interdependence and independence in group decision-making. The bees in effect divide the decision problem into two stages: setting the agenda through the choice of candidate sites, and evaluation of the quality of those candidates. The bees’ trick is that they decide interdependently at the stage of agenda-setting, but independently at the stage of evaluation. Scout bees are more likely to investigate sites proposed by others—they do not simply roam the landscape heedless of other bees’ recommendations—yet when the investigation is done, bees throw their support to a given site based on an independent evaluation, rather than blindly copying the conclusions of previous investigators. Interdependence and independence both contribute to the success of the bees’ decision procedure. Without interdependence at the agenda-setting stage, the scout bees would separately investigate a random scattering of candidate sites and thus might fail to reach any consensus at all—a disastrous result for the swarm as a whole, which cannot afford to dither. Without independence at the evaluation stage, the bees would fall prey to fads or informational cascades in which blind copying of some by others would often produce consensus on a poor choice of nest site. The swarm faces a decisional environment that demands both speed and accuracy. To navigate this tradeoff, the bees have evolved an optimizing procedure that neatly combines consensus formation with independent judgment. Seeley’s book offers a vivid portrait not only of its apian subjects but also of its author, who comes across as a biologist in full—profoundly knowledgeable in his specialty, but also broadminded and curious about other problems. One wishes, however, that Seeley had done more to connect human and non-human group decision-making. Despite the book’s ambitious title, which suggests a sustained comparison between honeybees and humans, Seeley devotes only a final chapter to the subject, and the chapter is enfeebled by its choice of examples—principally New England town meetings and, most frequently, faculty meetings in Seeley’s department. I have no doubt biology departments, law schools, and other academic swarms have more than their share of drones and queen bees, but the most interesting applications of the research and mechanisms that Seeley discusses lie elsewhere. The bees’ combination of interdependence at the agenda-setting stage and independence at the stage of evaluation suggests a broadly fruitful approach to institutional design, one that might be built into the decision-making procedures of multi-member judicial bodies or regulatory agencies, executive search committees, the research and development departments of firms, and elsewhere. In general, something like the bees’ procedure may be desirable for any group that (at least with respect to certain issues) has common interests and faces a decisional environment in which the agenda is ill-defined, yet in which collective decisions must be made both quickly and accurately. In many cases, to be sure, human groups do not have bedrock common interests or preferences. Instead they have genuine conflicts of interest or incompatiblities of aims and values that go all the way down. Yet in such cases heterogeneous groups tend to fissure into more homogeneous subgroups, or to drive out dissenters; over time, self-sorting tends to produce human swarms with common preferences, implying that conflict will tend to occur across rather than within groups. At any rate, neither Seeley nor anyone else suggests that the bees’ optimizing procedures hold lessons for all cases of collective decisionmaking in human societies, only that in important cases there are useful lessons to be drawn. The fertility and the range of the possible applications shows that Seeley’s work—extended over years and summarized clearly and engagingly here—is a model of biological research that builds bridges to the social sciences, and to the practical arts of institutional design for humans.